Sam “The Bam” Cunningham was a solid and hard-charging running back for the New England Patriots back in the day. Of course, that day didn’t include the type of winning that Patriots fans are accustomed to these days but Sam “The Bam” is still revered throughout the Boston area. His namesake also played for the Patriots of Prairiland High School and left an indelible mark on opponents through his crushing tackles as a cornerback and safety. Unfortunately, several of those collisions cost Sam his senior year on the field with his buddies. Concussions are nothing to fool with when you have such a bright future ahead of you. Despite not playing for the Patriots this season, Sam continues to make his impact felt. He practices, lifts, runs, sweats, yells and does everything he can to will the Patriots to win on Friday night. His computer skills also came in handy when putting together the team’s weekly hype reel to get ready for that week’s opponents. 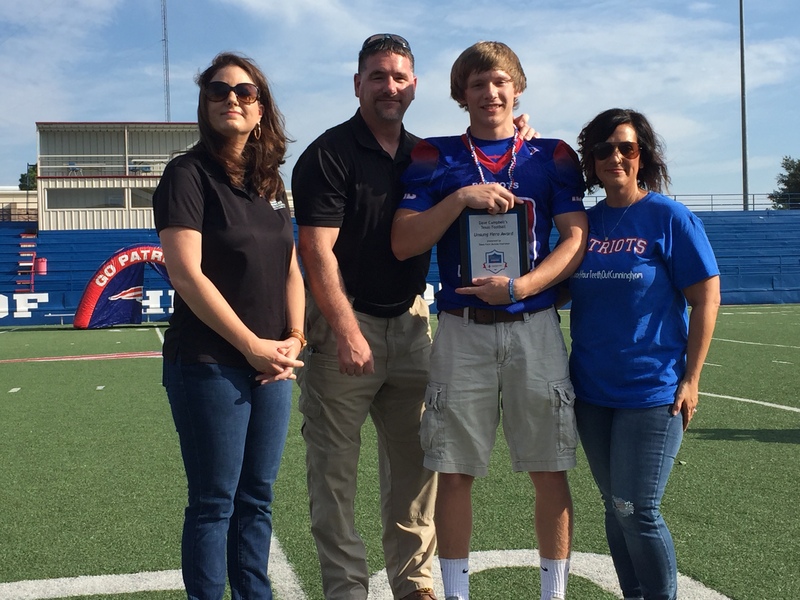 When Dave Campbell’s Texas Football partnered with Texas Farm Bureau Insurance to create the Unsung Hero Award, it was exactly young men like Sam Cunnigham that we had in mind. As part of winning this honor, given to just five young men each football season, Sam will receive $500 from Texas Farm Bureau Insurance to use toward college. He plans to pursue a career focused on IT or computer programming as he’s already built his own computer at the house. No one around the Prairiland High School program or the Pattonville community will be surprised when Sam Cunningham finds success in whatever comes next.